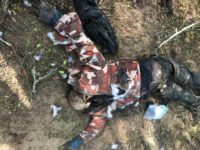 Graphic: Five Migrants’ Bodies Discovered in Texas — 80 Miles from Border - CALIBERHITTING.COM - The Alternative, To Alternative Media. Deputies in South Texas are in the process of recovering the badly decomposed bodies of five migrants who appeared to have died from exposure during this week’s freezing weather conditions. The deaths occurred in Brooks County where it appears the migrants were attempting to circumvent the U.S. Border Patrol Checkpoint located south of Falfurrias.